Van Horn Public Library invites all area residents to the final event in our One Town, One Title program. Each year SELCO works with local libraries to build regional author tours around Minnesota Book Award (MNBA) finalists and winners. Van Horn Public Library is delighted to be part of the 2017 tour which features regional favorite Doug Ohman at 7:00pm on March 2nd at the Pine Island Area Historical Center, 314 North Main Street. This event, like all in the series, is free and open to the public. 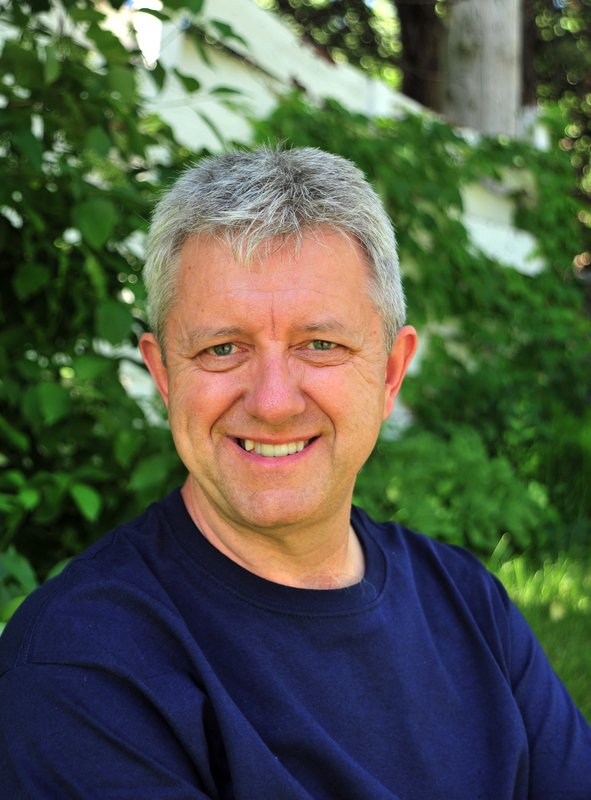 An avid speaker, storyteller, and photographer, Doug has deep roots in Minnesota and has been a part of the creation of eight books featuring his photography. Prairie, Lake, Forest: Minnesota’s State Parks was a 2011 MNBA Finalist and Barns of Minnesota was a Finalist in 2006. Ohman has captured the varied essence of the state and has created several photographic series on such subjects as cabins, barns and schoolhouses. In his presentation Vanishing Landmarks he’ll explore the back roads and small towns. We’ll hear the stories and history of Minnesota through historic buildings that are quickly disappearing. Doug will share his own experiences visiting many of these sites from Minnesota’s Oldest Courthouse to the last Civil War recruiting station. Along with being an award-winning photographer, Doug Ohman is an author, storyteller, and popular public speaker. His work has been widely published in books, calendars, and numerous state and national magazines. Over the past seven years, Ohman has been working with the Minnesota Historical Society on the popular book series, “Minnesota Byways,” which includes Ohman’s exquisite photographs, coupled with texts by some of Minnesota finest authors, on the state’s vanishing historic sites—churches, barns, courthouses, schoolhouses, cabins, and libraries. Ohman was born and raised in Anoka, Minnesota, and graduated from the University of Minnesota with a degree in history and geography. Before turning to full-time photography, he worked as the director of operations at the Mall of America’s Camp Snoopy. He now makes a living through landscape and historical photography, traveling thousands of miles each year to document his subjects, while at the same time making regular stops at more than 30 art fairs and festivals around the state. The SELCO Winter Author Tour project is made possible with money from Minnesota’s Arts and Cultural Heritage Fund and the people of Minnesota for Library Legacy activities. For more information call 507-356-8558 or email pipl@selco.info. Van Horn Public Library invites all Pine Island area residents to participate in the fifth annual One Town, One Title program from January 28 – March 2, 2017. 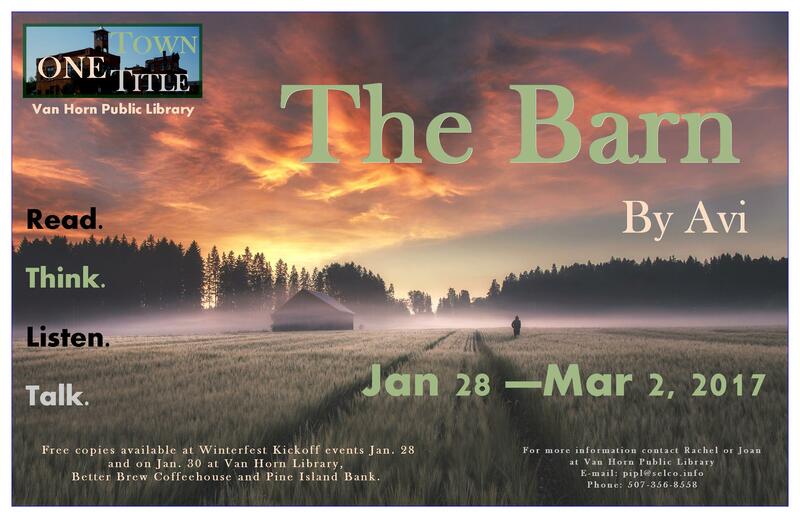 The selection this year is “The Barn” by Avi. Free copies of the book are available at Van Horn Public Library, Better Brew Coffeehouse and Pine Island Bank until March 3rd. On WEDNESDAY, FEBRUARY 8TH the monthly Van Horn Book Club will be held at 6:00pm at Better Brew Coffeehouse, 301 N. Main St. As always, everyone is welcome to join the group for a cuppa and an informal chat about the book and the issues it brings up about family, loyalty and coping with loss. ABOUT “The Barn”: Ben is away at school when his father mysteriously falls ill in the spring of 1855. With no adults to help, he and his brother and sister must take over the family farm in Oregon Territory’s rugged Willamette Valley. 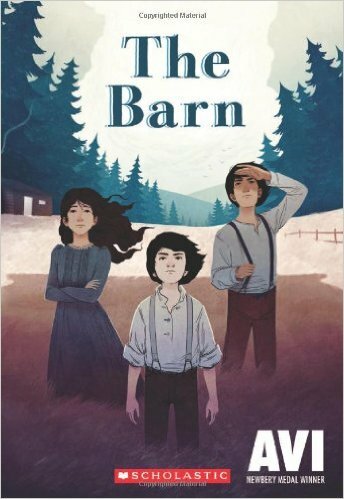 Despite his siblings’ doubts, Ben is determined to build the barn Father had planned, in the hope of waking him from his silent, frozen state. But will it be enough? This short beautiful story will delight the entire family. Avi’s work spans nearly every genre and has received nearly every major prize, including the Newbery Medal for CRISPIN: THE CROSS OF LEAD and Newbery Honors for NOTHING BUT THE TRUTH and THE TRUE CONFESSIONS OF CHARLOTTE DOYLE. 2017 One Town One Title Coming Soon!!! Van Horn Public Library invites all Pine Island area residents to participate in the fifth annual One Town, One Title program from January 28 – March 2, 2017. The selection this year is “The Barn” by Avi. Free copies of the book will be available at several Winterfest events (details below) on January 28th and at Van Horn Public Library, Better Brew Coffeehouse and Pine Island Bank beginning January 30th. One Town, One Title 2017 will kickoff January 28th as part of Pine Island’s Winterfest celebration. Van Horn Library Board Member Kim Aarsvold will join her husband Mark Aarsvold in conducting a Story Time at Better Brew Coffeehouse, 301 N. Main St. at 10:30am. Free copies of “The Barn” will be available as well as at the Winterfest Headquarters at the Pine Island Golf Course from 5pm to 8pm. On Saturday, February 25th from 10am to noon everyone is invited to tour two local family farms where we will learn about the past and future of dairy farming as well as get a chance for a first hand view of their facilities. The Alberts family has been in the dairy farming business since 1854 and the original Knutson Family Farms barn was constructed in the early part of the 1900’s. Group transportation will leave the library at approximately 9:45am. Sign-up is necessary. Please stop in at the upstairs circulation desk during library hours or call 356-8558 to reserve a spot. Each year SELCO works with local libraries to build regional author tours around Minnesota Book Award (MNBA) finalists and winners. Van Horn Public Library is delighted to be part of the 2017 tour which features regional favorite Doug Ohman. His talk Vanishing Landmarks will be the One Town, One Title Finale event at 7:00pm on March 2nd at the Pine Island Area Historical Center, 314 North Main Street. An avid speaker, storyteller, and photographer, Doug has deep roots in Minnesota and has captured the varied essence of the state and created several photographic series on such subjects as cabins, barns and schoolhouses. Vanishing Landmarks explores the back roads and small towns with stories of Minnesota through historic buildings that are quickly disappearing. Ohman will share his own experiences visiting many of these sites from Minnesota’s Oldest Courthouse to the last Civil War recruiting station. There is no charge for the any of the One Town, One Title events or for the books themselves and information about the events as well as a list of suggested discussion topic will be included with each copy. 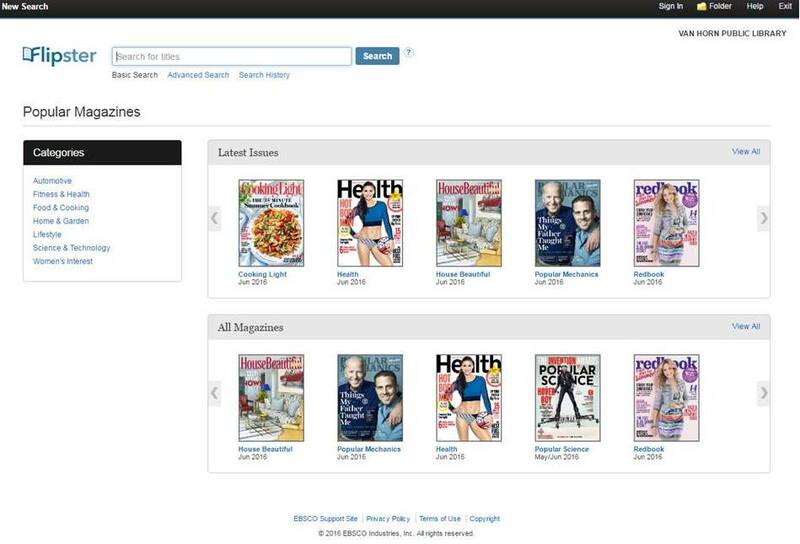 Now available through Van Horn Public Library – digital magazines using Flipster – a digital magazine service that allows you to browse the latest issues of a variety of popular magazines including House Beautiful, Popular Science, Redbook and more! All you need is your library card number to log in. Magazines can also be downloaded to iOS or Android devices using the Flipster app (search for “Flipster” in your app store). Have questions or need help getting started with Flipster? 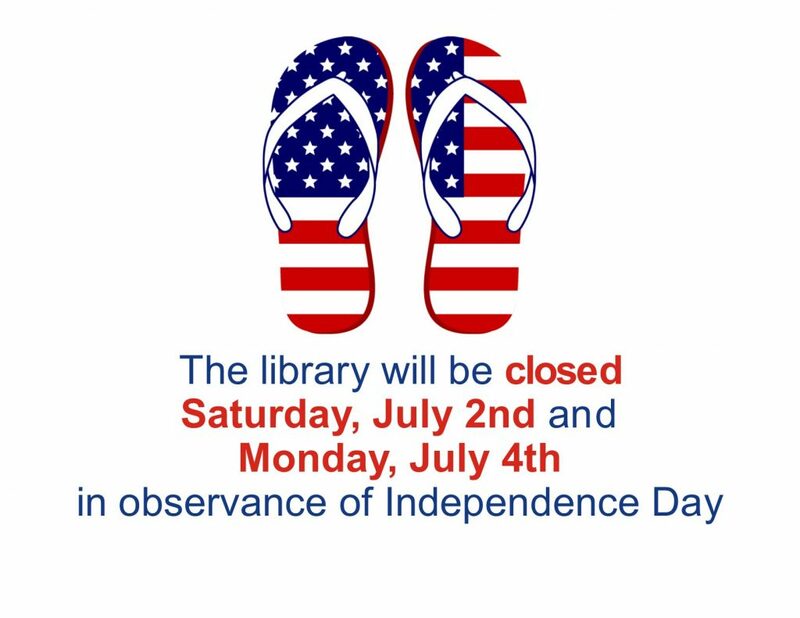 Stop by the library, call us at 356-8558 or e-mail us at pipl@selco.info. Van Horn Public Library invites all area youth who participated in the 2016 Summer Reading Program, Ready, Get Set, READ to our Finale Celebration on Tuesday, July 26th at 2 pm in City Park. Please join Library Director Morgan Hansen and Youth Librarian Joan Sand for games, snacks, and prizes to celebrate your fantastic reading accomplishments over the summer. All Library programs are FREE and open to all ages. In case of special needs, please notify the library in advance so accommodations can be made. For further information contact Van Horn Public Library at 507-356-8558, pipl@selco.info, or “like” VHPL on Facebook. Library Olympics at Van Horn Public Library! Van Horn Public Library invites all area youth to participate in our third special event of the summer. 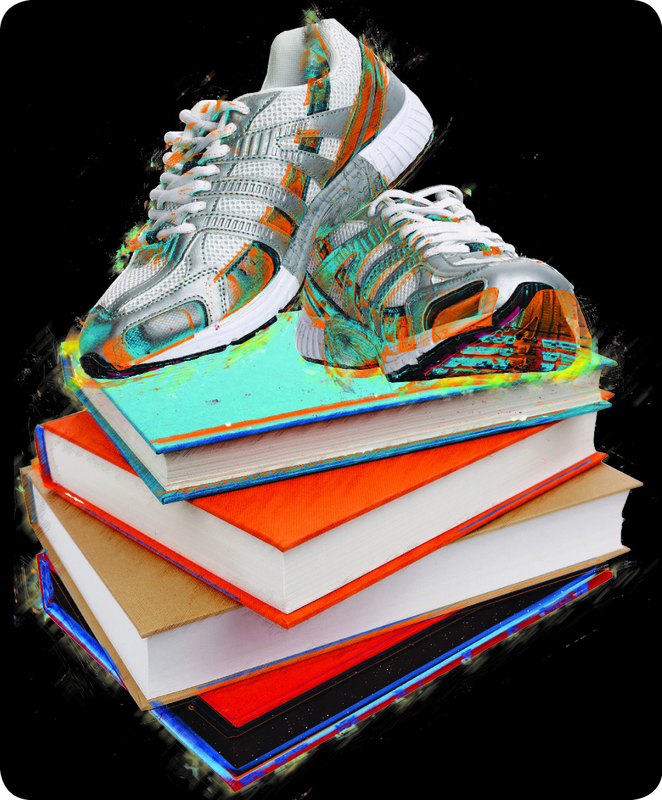 On Tuesday, July 19th in honor of the Summer Olympics, we invite everyone to exercise your body AND your brain with races, contests, puzzles, brain teasers and more at the Van Horn Library Summer Olympics! Events and games will be held both inside and out of the Library from 2pm to 3pm! For further information about the Summer Reading Program, contact Van Horn Public Library at 507-356-8558, pipl@selco.info, or “like” VHPL on Facebook. This project is made possible with money from Minnesota’s Arts and Cultural Heritage Fund (ACHF) and the people of Minnesota for Library Legacy activities. The ACHF was created in 2008 from the Clean Water, Land and Legacy amendment to the Minnesota State Constitution. Minnesota’s 365 public libraries receive funding distributed through existing formulas to the 12 Minnesota Regional Library Systems to provide programs and services in four areas: arts (visual, performing and media), culture, literary and Minnesota history. Hula Hoops will Leave You Dizzy with Excitement! Faribault’s own queen of the hula hoop, Adrienne Lee, is coming to Van Horn Public Library! Adrienne has been hooping since 2008. She will delight us on July 12 at 2:00 p.m. on the lawn of the Library with a 20-minute hula hoop performance set to music. (Rain location: Pine Island American Legion) Stay after the performance to ask questions, get demos, and try out a hula hoop for yourself! Adrienne also makes custom hula hoops and will be taking orders if you are interested in purchasing a hoop to call your very own! For further information about the Summer Reading Program, contact Van Horn Public Library at 507-356-8558, pipl@selco.info, visit their website at http://pineisland.lib.mn.us, or “like” VHPL on Facebook. Things are going to get Yo-Yo! Van Horn Public Library is thrilled to welcome Dazzling Dave, Yo-yo Master and performer, for a fun and entertaining show to kickoff the Summer Reading Program for 2016. Dave does all kinds of tricks and incorporates science into his presentation. 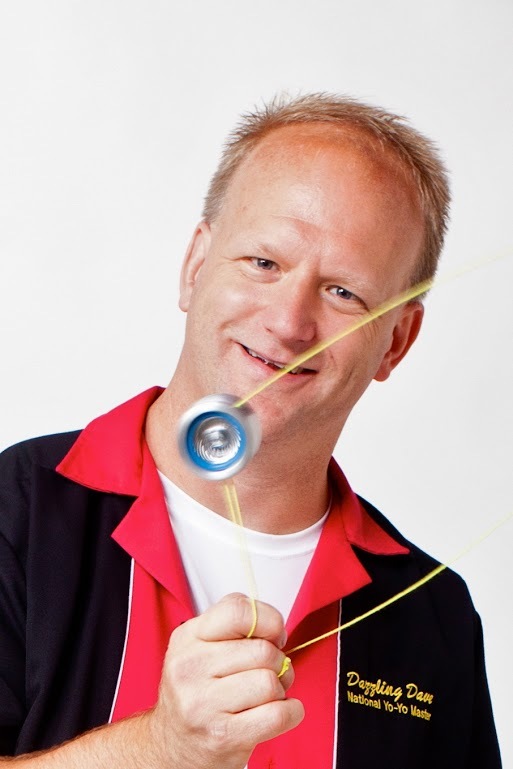 On Wednesday, June 22 the library will be spinning, rocking and rolling with Dave and his yo-yo fun! The FREE show starts at 2:00 p.m. on the lawn behind the library (Rain location: Pine Island American Legion). Dazzling Dave Schulte is a professional yo-yo performer and highly acclaimed champion who has circled the globe since 1998, thrilling audiences everywhere with his tricks and tips, all designed to entertain, educate, and illuminate the beauty of the growing sport of professional yo-yo. In October of 2001, Dazzling Dave was named to an elite group of National Yo-Yo Masters, making him one of the exclusive members of the Yo-Yo Judges at the World and National Yo-Yo Championships each year. For further information about the Summer Reading Program, contact Van Horn Public Library at 507-356-8558, pipl@selco.info or “like” VHPL on Facebook. 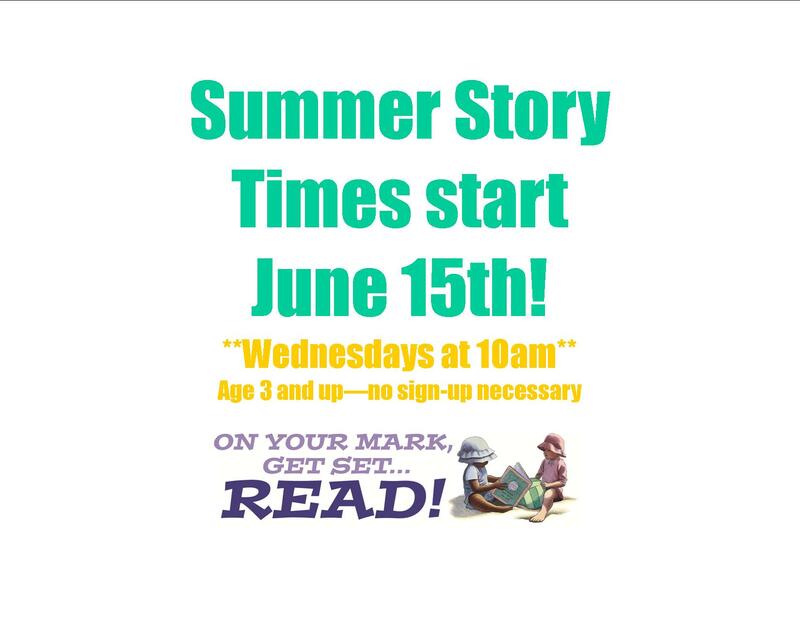 Summer Story Time Starts Next Week!